Bright green vineyards are set against a harsh desert backdrop. 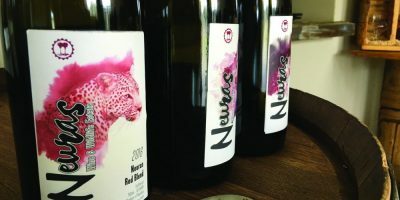 Neuras Wine and Wildlife Estate mainly consist of a stony desert or savannah grassland but nevertheless, it is an oasis in every sense of the word. Because the estate sits on a geological fault that creates a near-perfect terroir for cultivating grapes. Five springs provide pure water, while the mountains shield the earth from the unforgiving desert wind and the alkaline soil is just right for vines. A full wine tour takes you through the vineyard, the cellar and to the fountains. But this is not the only excitement on offer. A thrilling highlight is the cheetah feeding session. Upon entering the camp in a game viewer, guests stand on a viewing platform and the cheetahs race up to them on top of the hill. 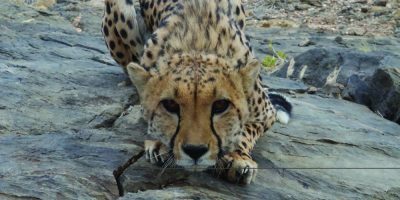 Surrounded by cheetahs, guests come into eye-level contact with these magnificent beauties which have been rescued as cubs and can unfortunately no longer be released into the wild. This experience presents amazing photo opportunities. 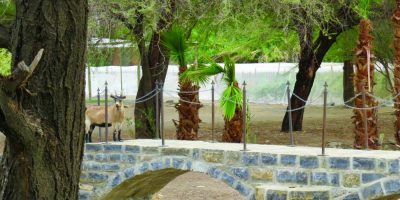 The cheetahs certainly do not feature on the “cuddle corner” list, but back at the lodge guests can pet adorable goats. Neuras presents itself in a down-to-earth setup with the old homestead still intact. Geese and peacocks roam on the lawn. There is no electricity supply from Nampower – only a generator, solar panels and a battery system. The cement dam has been converted into a swimming pool with an old windmill next to it, the most typical characteristic of the Namibian countryside. First cultivated in 1894, Neuras Estate served as a vegetable and cereal farm supplying the German Schutztruppe with fresh produce. 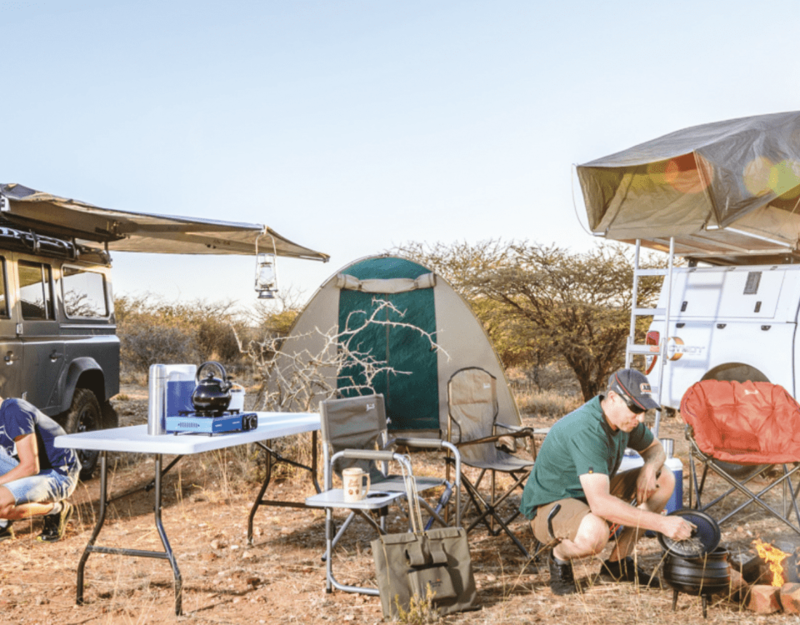 Today this piece of land is known rather for its wine, and more prominently for Rudie and Marlice van Vuuren’s on-going conservation projects concerning Namibia’s landscapes, cultures and wildlife. N/a’an ku sê bought Neuras in 2012 with the intention for these 14,400 hectares to become a model of conservation budding from their N/a’an ku sê Foundation founded in 2006. The welcome mat is out for day visitors and overnight guests who are in search of the rustic farm experience. Guests can enjoy home-cooked Namibian meals, a taste of the simple joys of local cuisine combined with elegance and refinement. The braai facilities sheltered in the shade of trees also add to an authentic Namibian farm experience. Ancient canyons with fascinating geological formations provide marvellous opportunities for nature hikes. Do you have a burning desire to make a change? The entire N/a’an ku sê Collection offers guests the chance to become actively involved in the country’s conservation projects. Become a volunteer and help to restore the environment, while meeting like-minded people and learning all about Namibia. This article was published in the Winter 2018 edition of Travel News Namibia.